Who are the patients at The Dispensary? At The Dispensary, our patients are the foundation of our service and the community. They are our neighbors, our friends, and those in need of assistance in some cases to cope with the debilitating conditions they endure and face daily. Compassion, understanding, and their comfort are our primary goals. At The Dispensary, we strive to assist however we may beyond the simple purchase of their required medication, and to further the harmonious balance between the communities and the patients we assist. 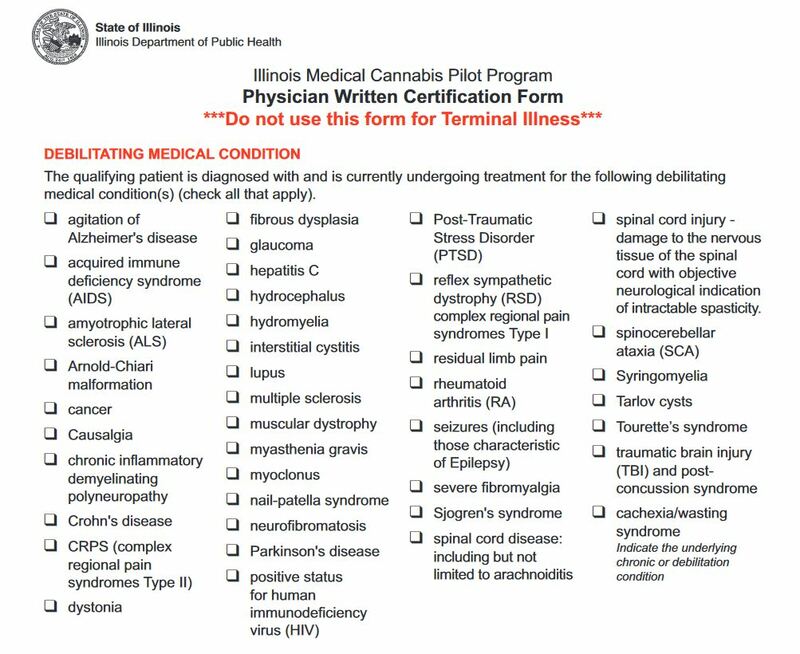 Illinois currently has two ways to join the medical cannabis program, as of January 31st, 2019. Patients may apply under the Medical Cannabis Pilot Program (MCPP) or the Opioid Alternative Pilot Program (OAPP). MCPP patients must have one of 40 allowable conditions and can apply for a one, two, or three year medical card. The fee for a three year card is $250. See Helpful Links for New MCPP Patients below for more information. OAPP patients must have a condition which opioids could be prescribed or a current prescription for opioids. The fee for a ninety (90) day card is $10. To renew, the patient must revisit their physician and reapply to the program every ninety (90) days. See Helpful Links for New OAPP Patients below for more information. The links below provide a starting point for patients looking to join the medical cannabis pilot program. At this time, all patients should apply through the Online Patient Application Portal except for Terminal Illness Patients. Veterans do not need to submit the Physician Certification Form and instead may submit 12 months of records from a VA Facility. Patients are no longer required to undergo fingerprinting and a background check. Please view our FAQ page and links below for more information. Effective Feburary 1st, 2019, patients who apply for a Medical Cannabis Registry Card on-line will receive provisional access to a licensed dispensary of their choosing within 24 hours of completing the application process. Qualifying patients who submit an application on-line before 6PM will be able to download their provisional registration card the following day after 8:30AM. We recommend patients call their dispensary, or visit our Verify Patient Status page to make sure their provisional registration card is active before driving to their chosen dispensary. All patients that applied on-line between December 1st, 2018 and January 31st, 2019 will be processed on February 1st, 2019 and gain provisional access starting February 2nd, 2019. Qualifying patients who submit a paper application do NOT receive a provisional (temporary) registry card and must wait for the receipt of their permanent registry card. Visit the Online Patient Application Portal and login with your username and password to view and print your provisional registration. Please note, patients with provisional access cannot change their dispensary until their application has been formally approved (within 90 days). Select our dispensary (The Dispensary, District 1, 1801 16th Ave, Fulton, IL) as your provisional dispensary and receive an automatic $10 discount on your first visit and purchase. For patients that have submitted a paper application between 12/1/18 and 1/31/19, there is a workaround to obtain your provisional patient card. Those patients may submit a new on-line application. Complete the application with the same information that was used for your original paper application and pay the associated fee for your one, two, or three year registry card using a debit or credit card. You will then be able to print your provisional registration within 24 hours, just as any new on-line applicant. Before processing any paper application, the Department of Public Health will cross reference all paper applications with online applications, and if duplicates are found which were submitted between 12/1/18 and 1/31/19, DPH will void or return the check, money order, or cashier check submitted with the original paper application. Please note, this workaround is only valid for patients who submitted a paper application between December 1st, 2018 and January 31st, 2019. If you originally applied outside of these dates and try to submit a second application, your payment will NOT be refunded. If the above is overwhelming, prospective patients are also welcome to visit us in person at The Dispensary Fulton. Please remember to bring your government issued ID, and our front desk staff can help answer questions and assist you with the application process. The Illinois Department of Health launched the OAPP on January 31st, 2019. Both Patients and Physicians may apply and register online using the OAPP Online Application Portal. The OAPP goes live on January 31st of 2019. Prospective patients will need to see their physician. The physician will have to register with the state and submit the required paperwork using an electronic PIN on the OAPP Online Application Portal. Patients do not need a Physician Certification Form for the Opioid program. Use the Contact Us page to request a list of participating physicians within the state. We have no relationship with any licensed physicians. Your desired dispensary (please note, due to the state system, opioid patients will not be able to switch dispensaries and must stick with their original chosen provider. When reapplying, patients may switch at that time, which is every 90 days). OAPP patients signing up with The Dispensary Fulton (The Dispensary, District 1, 1801 16th Ave, Fulton, IL) 1 will receive an automatic $10 discount on their first visit and purchase. After applying, the state will verify your information and match it to your physician’s submission. Within minutes, you will be emailed your patient ID and will be able to purchase from a licensed dispensary which is valid for 90 days assuming your physician has submitted their required information. No plastic or hard cards will be given for the OAPP, only paper cards delivered via email. Additionally, The Dispensary Fulton in District 1 has a public access lobby area. For those that are intimidated by the process or don’t have access to a computer and scanner, we are happy to assist. Bring a state issued ID and your application materials, and our staff will help you apply, including scanning any documents, taking your picture for the passport photo, and assisting with your application submission. Come in, sit down, ask questions about the program, and apply. We are here to assist. All patients signing up with The Dispensary Fulton in District 1, either as a provisional MCPP patient or as an OAPP patient, will receive a $10 credit on their first purchase and visit to our facility. Coupled with our everyday low prices and everyday specials (view our menu), we want to be the dispensary you choose to help relieve your everyday ailments. Not only does The Dispensary Fulton offer the most affordable medicine in the state of Illinois, we also offer patient services including an online order system and private patient consultations. Be sure to check out the ‘Before You Visit’ and ‘For Existing Patients’ tabs below for more information. We often hear many new patients are also looking for participating physicians. To address these concerns, we have assembled a list of participating physicians throughout the state. We have no business interest or relationships with any of these groups and are merely providing these organizations to help patients upon request. Use the Contact Us page and request more information about participating physicians throughout the state. Please note, only MCPP patients may change their selected dispensary. MCPP patients may change their medical cannabis dispensary by selecting another licensed dispensary at any time. There is no charge for this change. A list of all licensed dispensaries can be found here. If you are unable to download, email, or fill out the above form, please visit our Dispensary Selection Page and we will submit the information on your behalf. For patients that have just changed to The Dispensary Fulton and have waited the suggested 24 hours after hearing confirmation from IDPH, you may want to verify your patient status in our system before coming to visit. Visit our Patient Verification Status page or call us at (815) 208-7701 with your QP Number, and we can look you up in our system to make sure you are legally able to purchase medicine from our facility. This only needs to be completed after changing to or registering for the first time with The Dispensary Fulton. The Dispensary prides itself on patient satisfaction and making your experiences with medical cannabis and your everyday ailments the best they can possibly be. We understand the need for private conversations and consultations to discuss medical cannabis, specific ailments, treatment options, proper usage, and any other topics required by the patient. With that, we’ve set up an option for patients and caregivers to schedule a private patient consultation. All patient consultations will be led by an employee-patient who can directly speak to the benefits of specific medical products and how they may work for you. Consultations will take place in a private room directly adjacent to the sales floor with a large conference table and multimedia capabilities. To schedule a private consultation, please visit our patient consultation page for more information and fill in the requested information to get your appointment scheduled today. Walk in consultations are accepted as available, but to best serve you, advanced scheduling is recommended. The Dispensary Fulton now offers online ordering for patients that know what they want and are in a hurry. Visit our Online Order page below to submit your request and take advantage of our Fast Lane. We’ll make sure to have your order packed and ready to go upon your arrival. With the Fast Lane, skip the queue by allowing us to pre-pack your order. By preparing your medicine in advance, we can continue to offer the high quality, personalized experience you’re used to for new and inquiring patients, as well as provide a speedy service to the well seasoned and informed patient at an extra register reserved just for Online Orders. For those that know what they want, and know they want to be in and out, we’re here to help make your life easier while still giving all patients the time and attention that they deserve to better their health and make well informed decisions about their treatment options. All new patients are required to undergo a patient orientation. If you would like to review, or have lost your original copy, you can download a digital version of our patient orientation package. Please also feel free to visit our Medical info page for additional information regarding cannabis and its medicinal properties.